While there are numerous known proofs (our presentation resembles Proof 9 most closely), we give a self-contained one that motivates the usage of Fourier analysis for periodic functions. where , and is the -th Fourier coefficient equal to . If is continuous and -periodic and is convergent, then converges uniformly to . Now we have the machinery to compute . (Of Basel) Let be a periodic function which is equal to when , and extended to the real line by . We compute the Fourier coefficient of . where the convergence is uniform (and in particular, pointwise). Setting finishes the proof. This entry was posted in Fourier analysis on April 11, 2019 by Victor Chen. The maximum bipartite matching is a well-known problem in graph theory, operations research, and economics. Also known by the name assignment problem, it models a marketplace with buyers and items, where every buyer has a valuation for each item, and we want to match (assign) each buyer to an item, with no item being shared. For social utility, an assignment that maximizes the total valuation is ideal. In graph theory, the Hungarian algorithm by Kuhn produces a matching in polynomial time maximizing the total weight of the edges. Independently, Bertsekas from operations research and Demange, Gale, and Sotomayor from the economics perspective both use an underlying auction to solve the same problem. The auction provides additional intuition for this problem not transparent when using only graph-theoretic techniques. Here we describe a simple auction algorithm, largely following the presentation from this blog post. To formulate this problem, we consider a bipartite graph , where represents buyers and represents items, with each edge having an nonnegative weight representing the value Buyer places on Item . A matching from to is a function such that for all , or . Below is the pseudocode of the auction algorithm. Intuitively, the algorithm is simulating a multi-item auction, where we put a price tag initialized to zero on each item. The queue represents the list of unmatched buyers, which is initialized to . In each iteration, a buyer is greedily matched with his most valued item minus the price tag. However, each time an item is matched, it becomes slightly more expensive, becoming less valuable to other buyers in future rounds. Consider the case when , where a group of buyers is being matched for a single item. Clearly whoever values the item the most will win the auction, but at what price? From the highlighted line in the above pseudocode, it is readily seen that a buyer drops out when the price is above his value. Thus, the final sale price is at most the second highest valuation among all buyers (plus ) . Hence, the above algorithm can be seen as a generalization of a second-price auction for multiple items. AUCTION( ) terminates within iterations. To see this, fix an item . Note that before each increment to , the inequality must hold. So the final price must satisfy . The number of iterations in the loop is at most the number of times a price is incremented, which is . By the handshaking lemma, , where is the number of edges in the bipartite graph. Thus, a priority queue-based implementation takes time at most . Now we analyze the valuation produced from the matching . The proof is short and self-contained but utilizes -complementary slackness, a concept related to primal-dual method in optimization. Since we can choose to be arbitrarily small, the theorem implies that output matching is arbitrarily close to optimal. In particular, if all the values are binary, setting implies that the algorithm terminates with a maximal matching, and its time complexity is cubic on dense graphs, on par with the Hungarian algorithm. We say that Buyer is -happy under if he is matched with an item that is -close to optimal, i.e., for all , For notational convenience, we will write , so a buyer being completely out-priced (being matched with an “empty” item) is also -happy. The theorem also implies that in any marketplace, there is a set of market-clearing prices, i.e., each buyer has at most one preferred item. If all the valuation are integers, then a variant of the above algorithm from the DGS paper produces a price vector that is pointwise minimal among all market-clearing prices. This entry was posted in economics on April 21, 2016 by Victor Chen. In data analysis, a REPL (read-evaluate-print-loop) is great for asking questions quickly about a dataset. As opposed to writing code using a compiler, an interactive environment lets us hone in on the right questions, which is of great importance for exploratory work. A typical REPL session — e.g., using R, Pig, Hive, Python — involves loading the dataset and performing a combination of filtering, projection, and transformation. Finding the appropriate combination may require many iterations, such as tweaking the various parameters used in filtering. The process of repeating almost the same commands can be quite tedious, especially dealing with wraparound lines. 1) Write script in a text editor. Execute it on the command line. During development, lines are typically appended to an existing script. So each script execution has a significant overlap with previous executions. This can be a bottleneck when loading the input or a particular transformation takes time to process. Executing a script also makes it harder to try out various transformation on the fly. 2) Write script in a text editor. Then copy and paste commands as needed into a REPL. While this allows many iteration, the physical act of copy-and-paste becomes the most dominant part of script writing, overshadowing the thought process. Furthermore, copy-and-paste from one window to another is somewhat challenging in a ssh session when working remotely. 3) Write script in a text editor. Execute the current line of the cursor in a REPL in a separate window. This workflow allows the flexibility of experimental work. Certain IDEs, such as RStudio, already has this functionality. However, if one is looking for a uniform experience across various languages, a simple shell experience can be achieved with the vim+tmux+slime combination, described next. Lastly, the vim-tmux-navigator plugin allows seamless navigation among vim split windows and tmux panes. This entry was posted in data analysis on February 20, 2016 by Victor Chen. The singular value decomposition (SVD) factorizes a matrix where are unitary and is diagonal with nonnegative entries. Unlike the eigenvalue decomposition, every (real or complex) matrix is guaranteed to have a SVD. Geometrically, the SVD implies that every linear transformation is equivalent to a rotation, a scaling, then another rotation. In data analysis, the SVD can be computed to perform principal component analysis (PCA), where an ellipsoid is used to “fit” a data matrix. In other words, once the SVD is computed, a partial SVD, can be used to approximate the matrix, where and are the left and right singular vectors, and are the singular values in decreasing order. Equivalently, a partial SVD is obtained by replacing the smaller singular values with zero in the factorization. Intuitively, with the length of each ellipsoid’s component equal to its corresponding singular value, keeping only the components with non-trivial length makes the ellipsoid a good fit to the data. Formally, the Eckart-Young-Mirsky Theorem states that a partial SVD provides the best approximation to among all low-rank matrices. The theorem has a short proof for either norm, but here we describe a slightly longer proof using spectral method. Before proceeding, since we will work with singular values of different matrices, we will write to denote the -th singular value of a matrix. 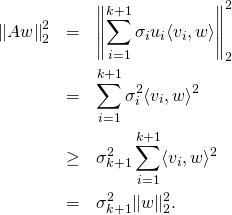 We first state the following lemma, which provides an estimate on how much a low-rank perturbation to a matrix can affect its singular values. Let and be any matrices, with having rank at most . The theorem is then an easy application of the above lemma. 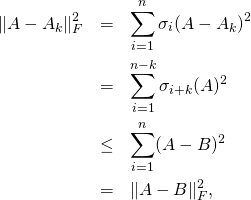 which by the lemma (setting ) is at most . To see this, let , , and , and note that is zero. Instead of invoking this inequality directly, we will prove the lemma from first principle. (Of lemma) We first prove the case when , i.e., . Combining both sides yields . completing the proof since is zero. This entry was posted in linear algebra on January 23, 2016 by Victor Chen.